A labrador retriever named Charlie in Indianapolis defied all odds when he survived a spill from a tractor and nearly died. Charlie loves riding on the tractor with his owner Jessica Parson on her family’s farm, but she suffered a fractured spine and a lacerated kidney when she slipped off and was crushed by a large piece of farming equipment being pulled behind the tractor. Purdue University’s Veterinary Team at their teaching hospital performed two surgeries to save Charlie’s life, including one to remove the failing kidney. Today, Charlie once again thrives on his family farm thanks to the efforts of the staff at Purdue Veterinary School, along with help from the Veterinary Care FoundationÂ andÂ the Veterinary Pet Insurance Fund. VPI awarded Charlie the winner of their annual 2014 VPI Hambone Award for the most unusual insurance claim of the year. 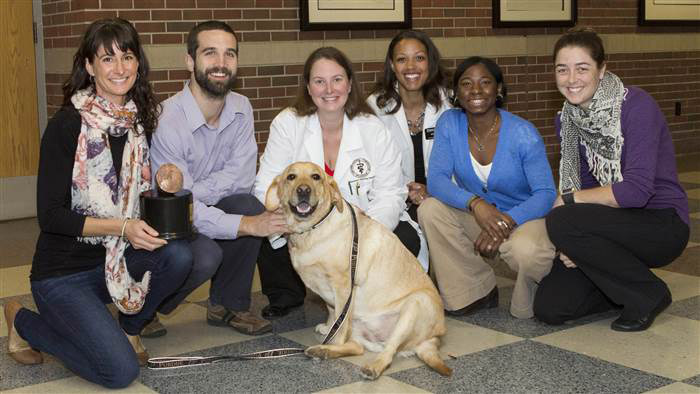 VPI and VCF award $10,000 to the Purdue University Teaching Hospital for their outstanding efforts to save Charlie. 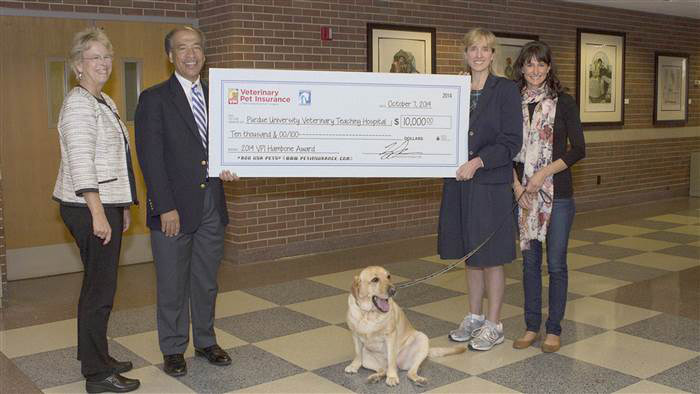 As part of the award, Purdue’s hospital will receive $10,000 from VPI through the Veterinary Care Foundation to help pet owners who cannot afford treatment. Charlie was the winner of the online voting between 12 nominees selected from 1.1 million insurance claims in the sixth year of the contest. Not only did she assist her veterinary team with receiving their award, Charlie also enjoyed a bundle of goodies that included treats, toys and of course an emergency pet first aid kit.